One of the most unforgettable and enchanting experiences you can have in India is to ride through the rippling, windswept desert on camelback and camp out under the stars. 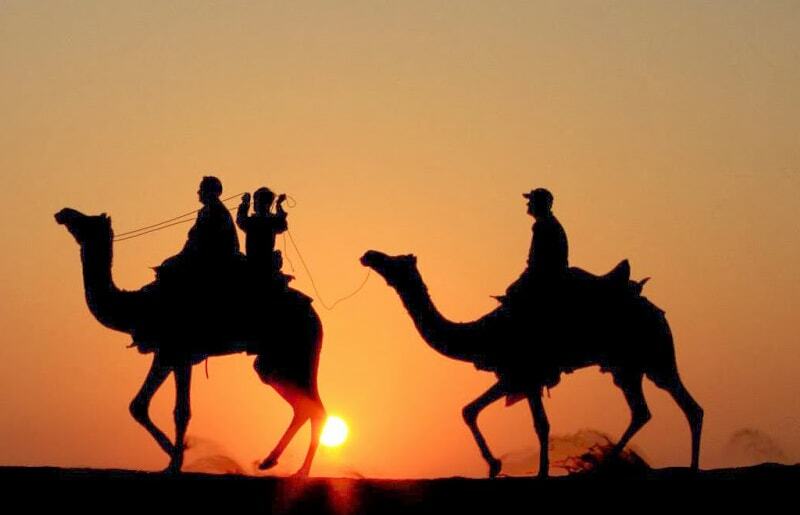 Taking a camel safari will also give you the opportunity to witness the rustic, rural desert life of India. While the desert can be barren, it's also surprisingly well populated. Needless to say, going into the desert with complete strangers can present numerous challenges — plus a bit of anxiety. Booking your safari with a trustworthy, Jodhpur taxi service provide best camel safari desert in Jodhpur & Jaisalmer. Begin by asking other travelers — many are also doing camel safaris in Jaisalmer — for up-to-date recommendations rather than relying completely on what you see online. The safari staffs often move from one company to another, and reviews get "tweaked up" by friends and family. All though pretty much every hotel or business in town will happily book a camel safari for a commission, it's big business in Jaisalmer, staying in a nice hotel does not ensure a nice experience in the desert. Adventure activities like paragliding, quad biking, dune dashing, hot air balloon safari, and others. Luxury camping, relaxing and overnight camping. Belly dance, fire dance, local tribal dance, music performances, puppet shows, and others. Moonlight dinner for a romantic time.